A record 24 riders gathered at Emma Cons Gardens, the small piazza opposite The Old Vic. With Jane leading we followed the railway tracks to Vauxhall. There the new cycle lane took us across Vauxhall bridge to the Embankment. Headed west along the embankment to Lots Road, then past Chelsea Harbour and through the new Imperial Wharf development. Back streets followed until we reached Bishops Park. Outward leg took only 1hour 10 min, so we had an extended break at the Café. This allowed some of us to have a look at Fulham Palace and then to find the memorial to members of the International Brigade who volunteered to fight in the Spanish Civil War. Return route backtracked to Wandsworth Bridge which we crossed to return to the south bank of the river. The south bank was then followed all through Battersea and Vauxhall, including the nice stretch through Battersea Park and the horrid stretch along 9 Elms Road. Finally via Black Prince Rd and Lambeth Walk we returned to Waterloo. Again excellent time was made and we were back 15 min early. 13 riders on a cool dry morning. Plan to ride a good stretch of the now nearly complete Quietway 1. 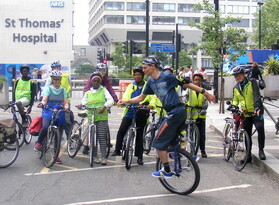 Full report on the Southwark Cyclists web site (Link here). Report from ride leader Philippa. 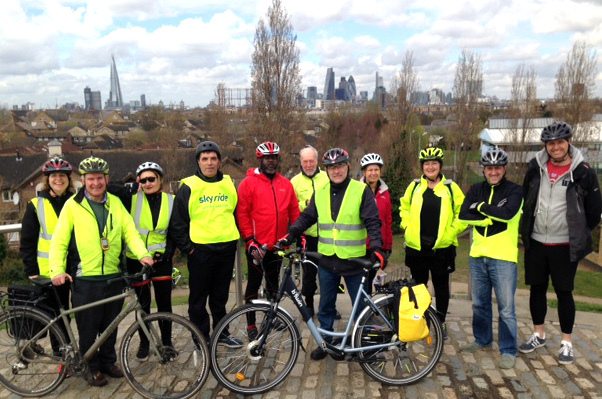 11 of us set off from Peckham Rye on a mainly sunny day although chilly after a prompt to all to support the LCC in pressing mayoral candidates to keep funding and improving cycling (Sign Up for Cycling). 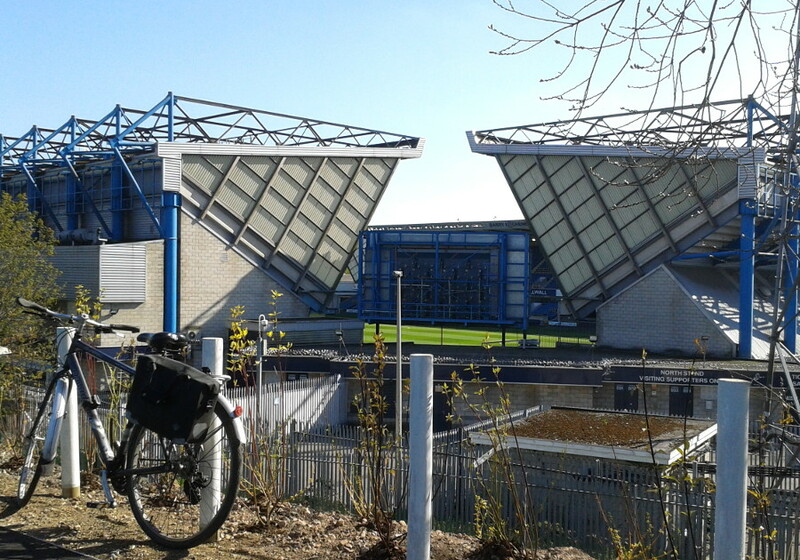 We headed down the Canal path to Burgess Park, round the fishing lake and worked our way through back street cycle routes across New Kent Road to meet up with Q1. Then on to Southwark Bridge Road and up Cycle Superhighway 7. Unfortunately at Southwark Bridge one of the group found she had a flat rear tyre. We paused for a photo whilst she went in to Cycle Surgery handily situated on the north side of the Bridge. They were able to fix the tyre straight away so the group decided to wait and all were determined to carry on with the route although we would be late getting back, though one person headed back as she needed to get back on time. Healthy Ride + Report, April 16th. Battersea Park. Leader Phillipa. 12 riders, including 3 new healthy riders, on a cold morning with rain about, although none materialised. Outward route to Blackfriars Bridge, passing the new extension to Tate Modern (opening in June). Then along part of the E-W Cycle Super and on eventually to Chelsea Bridge. Crossed this to get to the coffee stop at excellent La Gondola Cafe in Battersea Park (pastries still very good). Returned along south side of river including the interesting loop up and through Waterloo Station. Route at http://goo.gl/6cFvhG. 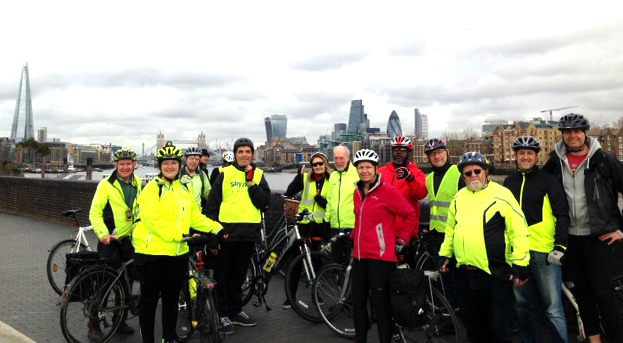 Despite heavy rain up to 9am, 16 riders gathered at 10am at Canada Water and headed off for a tour around Rotherhithe. Started across Southwark Park, then via King Stairs Gardens to the river at the Salter statues. Brief stop (see photo) before continuing along the Thames Path (National Route 4). A very low tide and several people spotted on the foreshore looking for objects of interest at the low tide mark. At the Surrey Docks Farm had time for a coffee stop and to admire the animals. Continued all the way to the start of the Deptford riverside at which point we began heading back. Around South Dock then Greenland Dock where we stopped briefly at the Sustrans Portrait Bench that commemorates Barry Mason, who started the healthy rides way back. Next through Russia Woodland to Stave Hill where most riders had the energy for the climb and were rewarded with the usual interesting views (see photo). Finally a loop down to Surrey Water and along the Albion Channel to Canada Water. This is a good ride for those who prefer off road paths, route at https://goo.gl/PTWPXX.